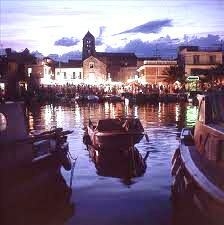 Vodice is one of the largest tourist centres on the Croatian Adriatic coast with beautiful views and islands to visit. It has shingle and sandy beaches to the west and east of the town centre. There is a varied collection of shops, including Italian ice cream stalls and jewellry shops. The town has a rich cultural heritag.and there is a variety of entertainment including films, aquarium and nightclubs. There is a full summer of oganised musical and cultural events. You will have the opportunity to make numerous daytrips and there is a lot of opportunity for recreation and sports. This makes Vodice a quality tourist destination. There is no rest without sport and recreation.tennis courts and indoor swimming pool, sailing clubs and windsurfing, tennis, diving – all points to an old Latin saying: “carpe diem” (seize the day). By bike or on foot, you can set off to the surroundings of Vodice which are marked by trails that pass through olive groves and vineyards. In addition to demanding mountain bike trails, there are trails leading to the ruins of historical value in the hinterland of Vodice.